ALLEVEN COLOUR SHIELD is a quick dry, water and maximum-transfer resistant formula with innovative skin tone adapting pigments, that provides the skin with an even and natural appearance, allowing you to use it anywhere at anytime. GLOW, the latest addition to the ALLEVEN family, offers a luminous finish for a glamorous, velvet-looking skin. The airbrush-like application is accurate and easy to use, leaving the skin like velvet to the touch and revealing a picture-perfect appearance of subtle, natural looking colour.The flawless result offers an instant healthy glow. ALLEVEN COLOUR SHIELD promotes the look of younger more even skin, while visibly diminishing imperfections. Easy and simple spray application. Note: We recommend uncovering as much of your body as possible to expose the zone you want to embellish with the treatment. Being bright and comfortable, your bathroom is the best place to correctly apply ALLEVEN. 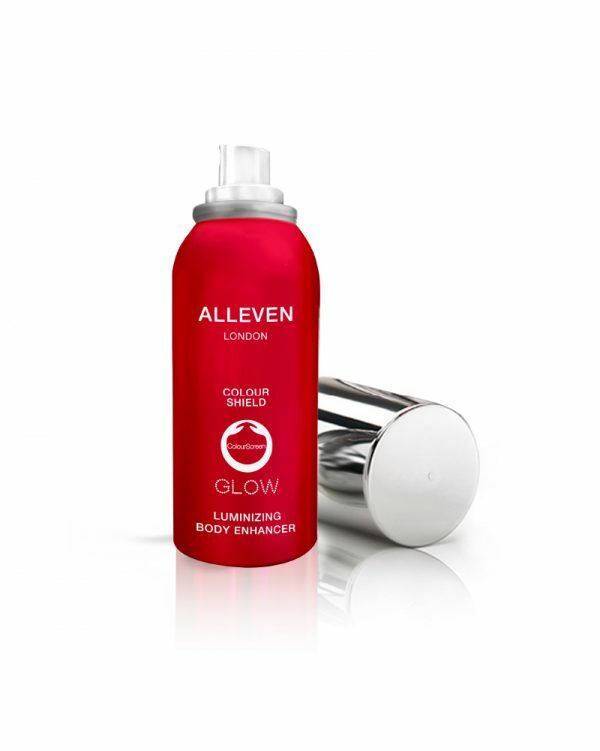 You can apply ALLEVEN all over your body or in a specific area you wish to beautify. 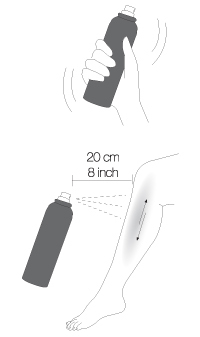 Always spray from a distance of around 20 cm / 8 inches. Avoid putting too much product on one area, as this can affect its lasting power and natural cover. Keep your hand moving to prevent colour “hot spots”. Spray using a continuous motion and in short bursts of 2-3 seconds. Remember to shake the spray frequently between bursts. Before getting dressed, let the product dry for 1-2 minutes and use your hand to check that ALLEVEN has dried to form a perfecting veil over your skin. Remove any powder residue (from the airbrush-fine mist) with your hand or soft or damp cloth to ensure maximum transfer-resistance. ALLEVEN can be removed easily using water and your normal body wash. Provides a very subtle gold luster throughout the body while hiding imperfections. Perfect for an elegant “luminous” finish. Veils the skin with sheer, tone-adapting pigments for an even and luminous appearance. Intelligent protection shield helps the skin fight off the harmful effects of solar radiation. Skin defense enhancer combats assaults that may alter the DNA. Natural bronzing activator, without needing the sun. Natural skin refiner and tone unifier.